When the New York Times tells you something, especially in the Green Blog, a safe bet is on the opposite. It seems like it happens every week. Another conventional wisdom shot to smithereens. This time it's the island nation Tuvalu, the famous "sinking" island, used for years as a rallying cry for action by climate-change alarmists. But last week scientists at the University of Aukland published results in the journal Nature Communications that "challenge perceptions" of the smart set. Sea-level rise and climatic change threaten the existence of atoll nations. Inundation and erosion are expected to render islands uninhabitable over the next century, forcing human migration. Here we present analysis of shoreline change in all 101 islands in the Pacific atoll nation of Tuvalu. Using remotely sensed data, change is analysed over the past four decades, a period when local sea level has risen at twice the global average (~3.90 ± 0.4 mm.yr−1). Results highlight a net increase in land area in Tuvalu of 73.5 ha (2.9%), despite sea-level rise, and land area increase in eight of nine atolls. In other words, Tuvalu has been growing this whole time. Over the past 40 years Tuvalu has added roughly 181 acres of new land—all while sea levels were rising at twice the global average. The results "challenge existing narratives of island loss," the scientists said—something frequently repeated in the pages of the New York Times. Since at least 2007 the Times has trumpeted fears that the Pacific island was sinking, running a Reuters blurb in its print edition with the headline, "Tuvalu: A Cry for Help." The article predicted the "ocean will swallow the country in 30 to 50 years." In July 2011, the Times ran an opinion piece in entitled, "Life After Land." 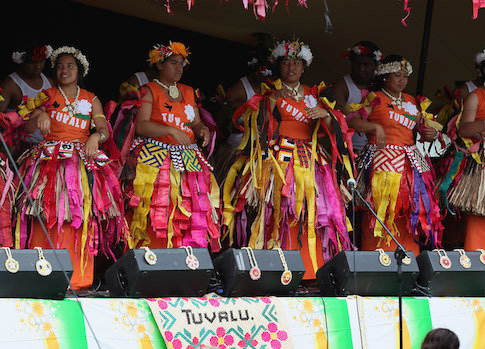 The editorial argued for a United Nations resolution to protect the people of Tuvalu once it "loses its permanent population and territory to rising seawater." "If the international community cannot or will not slow global warming, the least it can do is help those states prepare for life after land by recognizing a new category of state—the deterritorialized state," the editorial stated. A cartoon of an island sinking into the sea accompanied the piece. The paper's Green Blog predicted again in October 2011 Tuvalu would "become unlivable within 50 years." In its news pages the next year, the Times wrote, "many scientists say [Tuvalu] is getting smaller." The goalposts had moved slightly, and Tuvalu's "very existence" was threatened by the year 2100, when global sea levels could rise by 55 inches. The Times has been quiet about Tuvalu in recent years—and recent days. So far, the paper has neglected to report on the latest Tuvalu climate change news. The new study, however, should provide rich material for the Times since the researchers found that a growing Tuvalu in the midst of oppressive climate change allows for "vastly more nuanced" options for the future of climate change adaptation. The study dispelled "flawed assumptions that islands are static landforms, which will simply drown as the sea level rises." In all, the scientists found only a small subset of islands that had lost any area, with over 73 percent of the islands actually expanding in land area, some as high as 113 percent. "Results challenge perceptions of island loss, showing islands are dynamic features that will persist as sites for habitation over the next century," the scientists said, a slightly longer timeline than the Times told us. The scientists aren't exactly sure why the islands are growing—it could be extreme storm waves. But they do know it is driven by "environmental rather than anthropogenic processes." Thank God for climate change!